Korean spicy dipping sauce with doenjang and gochujang. Enjoy with bossam, grilled meat and vegetables. Made in a factory that also handles peanuts and sesame. Store in a cool dry place and refrigerate after opening. Consume within a month or by best before date. Ingredients: Soybean Paste (Soybean, Wheat Flour, Salt, Water) (63.14%), Corn Starch Syrup, Mixed Seasoning (Red Chilli Pepper Powder, Water, Salt, Garlic, Onion) (4.12%), Ethyl Alcohol, Garlic, Flavour Enhancer (E624), Hydrolysed Vegetable Protein (Wheat). 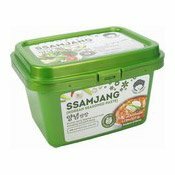 Simply enter your details below and we will send you an e-mail when “Ssamjang Korean Seasoned Paste (韓國包飯醬)” is back in stock!